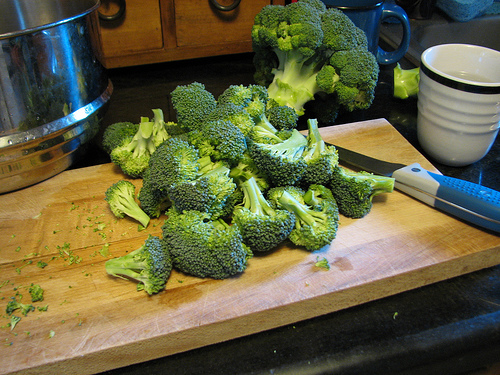 I’ve cooked a lot of broccoli over the years. Personally I think its best served bright green, still firm in texture with a bit of crunch left in it. I prefer steaming over water rather than blanching in water for two reasons. You get the most nutrition out of your veggies when they’re raw or steamed AND it takes less time, energy, & water to cook them in. At home I use a steamer pan. Put 2 inches of water in the pan, put the lid on, and heat over high heat. 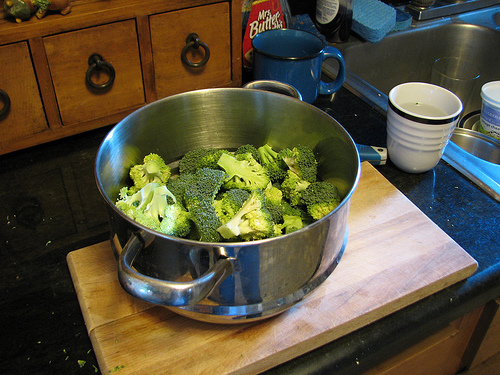 While the water comes to a full boil, wash the broccoli, cut it into florets then place it directly in the steamer insert. Place the pan over the boiling water and put the lid on the steamer insert. At an average altitude it takes from 6 to 7 minutes. Once cooked, run it under cold water to stop the cooking, or even better, use ice water to shock it. This process prevents carry over cooking. If I want to serve it hot, I place it in a dish, sprinkle with salt or a squeeze of lemon, then serve it immediately. Carry over cooking is what happens after you take food off or out of the heating source. The internal heat in hot food continues cooking the meat or vegetables. What this means is that carry over cooking can cause your food to overcook even after you’ve removed it from the heat source. When you account for this and stop the cooking by shocking vegetables in cold water you’ll notice a big difference. How? You’ll know when to pull your vegetables from the heat, cued by both color and texture. That’s the precise time to cool them down quickly. So give it a try and…EAT YOUR VEGETABLES! I was cooking with a friend here at her house and took a few photos as I helped her put dinner together. 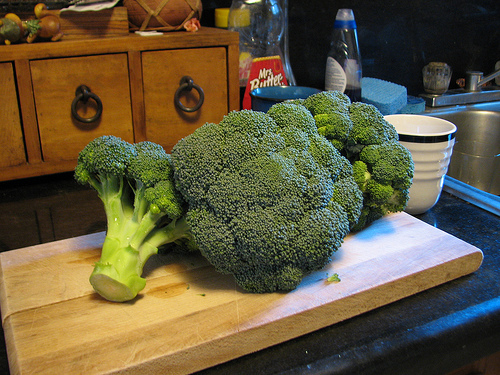 This entry was posted in Uncategorized and tagged broccoli, buy local, chef, chef@isimmer.com, cooking, diet, framer's market, green, health, seasonal cooking, steaming, vegetables, vitamins. Bookmark the permalink. 2 Responses to EAT YOUR BROCCOLI!